Sheffield has a long-standing friendship with Estelí and has been formally twinned since 1984. To celebrate 30 years of this partnership a delegation travelled from Sheffield to Estelí in the summer of 2014. People in Sheffield wanted to support Estelí and raised thousands of pounds to help them improve their lives. Building on its success, another visit is planned for November 2018, and Sheffield Estelí Society (SES) is currently inviting applications from interested people. The two cities’ collaborative links have been forged, developed and deepened through the work of SES. The group was formed in response to the Nicaraguan Revolution of 1979 that overthrew the 40 year dictatorship of the Somoza dynasty. The people of Estelí then found themselves in the midst of the brutal Contra war, sponsored by the US, the aim of which was to overthrow the democratically elected Sandinista government. They also wanted to show their solidarity in a practical way and in 1986 the first Sheffield delegation travelled to Estelí to help build the infrastructure needed to bring safe drinking water to the city. Further delegations followed with people from all walks of life travelling to Estelí to work on different projects and share their skills. In return they learnt from the many positive and vibrant cooperatives and social movements they encountered there. They brought back to Sheffield their innovative approaches to issues such as trade unionism, literacy campaigning, deaf education and women’s rights. Today Nicaragua is a very different country. The country still faces many economic and social challenges but huge advances have been made in health and education. They have been commended by the World Health Organisation for advances in eradicating food poverty. There is also a progressive environmental agenda including the development of sustainable tourism. Nicaraguans have a strong sense of community and a wealth of creative energy that is nowhere more evident than in Estelí itself. In recent years SES has contributed to a number of activities in the city including post-hurricane reconstruction, maternal health care, library services, and is currently supporting projects working with young people in mural painting,music, dance and drama. Sheffield’s sustained support, whether financial, practical or just in terms of the interest shown in their lives and community has meant a great deal to the self-reliant, resourceful and outward looking people of Estelí and this is very evident in the welcome extended to visitors from the city. Small amounts of money are made to go a long way and items like musical instruments taken out by visitors are hugely appreciated and treasured. “They have a very can-do and positive attitude to solving problems and improving their lives which is hugely inspiring” says Tricia, a long-standing supporter of SES. Participants in the two week November 2018 delegation visit will have the chance to visit a country that is, as yet, largely off world tourism routes and learn about its history and culture by living with local families and meeting people and professionals directly involved in the development projects. Visits to these will allow a sharing of ideas and experiences and there will be opportunities to join in local festivals and community activities. While most time will be spent within Estelí itself, there will also be visits out to the surrounding rivers and mountains, coffee growing areas and nature reserves. Mary Rose, a delegate on the 2014 trip, said: “I was struck by how politically and socially engaged people were. “They were very keen to talk to us about their lives and were interested to hear about ours. “The twinning arrangement clearly meant a lot to them and they really valued our support. 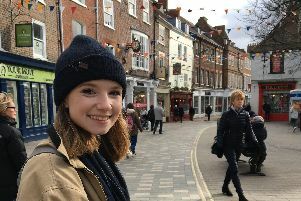 And Coralie, the leader of the 2014 delegation said:”It was a really rewarding experience facilitating the trip and watching the diverse group of Sheffielders develop meaningful relationships with a range of different people, families and projects. Although there is a full programme of visits and activities that are organised by the trip leader, with the assistance of local guides, there will also be some time for participants to pursue their own interests. As delegates will make their own travel arrangements, they will have ample opportunity to explore the country more widely before and after the two week programme. n The Telegraph welcomes column contributors on any topic - from health to equality and education to food. To take part or make a suggestion of a topic to cover , email telegraph@jpress.co.uk with details of what you would like featured and your contact information.